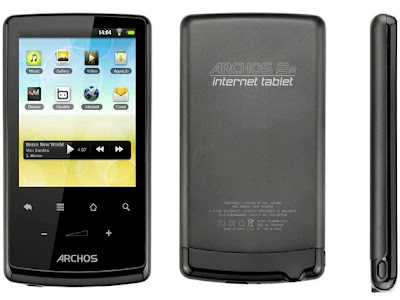 Some consider the Archos 28 as the first Wi-Fi connected Android device that has a price tag of less than $100. But I disagree (See: Affordable Android-powered iPad-like Tablet Computers). Anyway, this pocket-sized tablet computer and media comes with a 2.8-inch slim touch screen display and a wide range of features such as video and photo applications, high speed processor for fast Internet browsing, 3D games, and thousands of downloadable Android applications in the AppsLib. The Archos 28 offers 5 customizable home screens that enable advanced personalization, which means icons can be placed, moved or erased with just a flick of a finger. With the presence of home screen widgets, users can instantly access their favorite applications in a snap. The Archos 28 Internet Tablet allows you to play movies and videos in all popular formats. Its music, video and photo applications ensure the user a smooth browsing experience through the album covers. With the widgets added to the home screen, users get instant access and controls to media applications so they can make their own music playlists or browse songs and music favorites recently added or played. The Archos 28 Internet tablet makes your multimedia experience easier and smoother by supporting audio and video formats beyond the standards of Android. It also utilizes Samba and UPnP protocols, which allow its users to play movies, videos, and photos even if these files are located away from the device. You don’t need to store everything on your Archos 28 since there is no need for re-encoding. Simply drag, drop and play and you can enjoy all your videos and TV shows that easy. The Archos 28 Internet tablet also comes with a nice Gallery application to display all your photos in a beautiful way. You can start a slide show with transition effects, easily zoom in and out by double tapping on the screen, or share pictures with family and friends over the Internet. 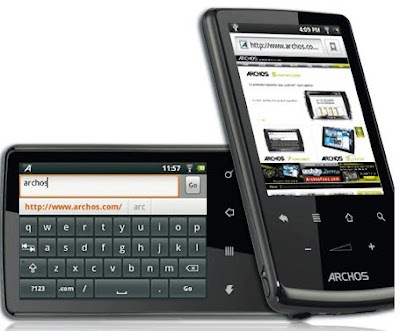 And speaking of the Archos 28 being a pocket computer, you could also connect a USB keyboard into it, which would help you do some productive work in a more efficient way.